The Lawrenceburg High School Girls Basketball Team (Lady Tigers) and their coaches always reach out in their community to offer their time to host special events. 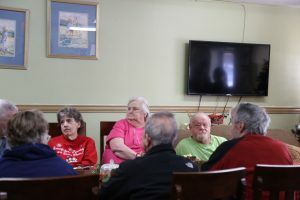 This year they reached out to Lutheran Community, part of Graceworks Housing Services, and hosted a holiday breakfast for the residents. This event took place on Wednesday, December 27th. 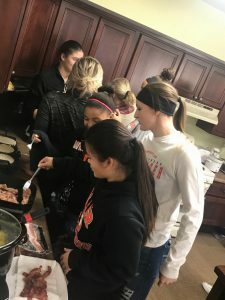 The LHS Girls Basketball Team prepared the meal which consisted of pancakes, sausage, bacon, eggs, oatmeal and fruit. There were approximately 20 girls from the team along with four coaches and parents. The residents interacted with the team and other guests. The team also brought gifts for the residents. They gave away a large amount of gift cards to Kroger and McDonald’s. 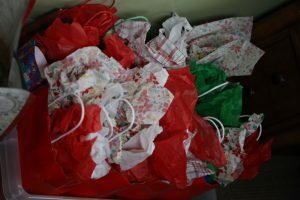 There were also gift bags full of daily essentials such as laundry soap, bath soap, deodorant, lotions, travel sets and other items. The team said they enjoyed the experience so much that they plan on returning to do another event in the future. There were pictures taken during the breakfast and with the consent of the residents there will be a story posted in the local paper about the event.